Visitors to St. Anne’s main lobby are greeted by our majestic Annual Giving Tree. It becomes the “Annual Giving Tree” as leaves are added that bear the names of our Annual Fund Donors. We invite you to help us spread the tree’s canopy by making a gift to the Annual Fund and thereby contribute to the well-being, joy and care of our Residents. 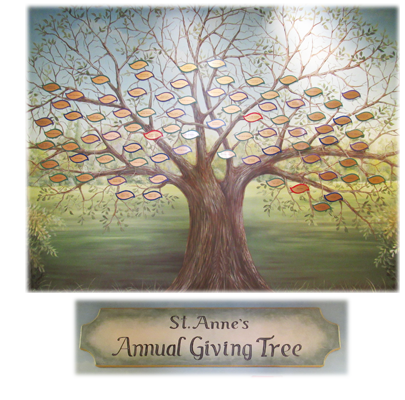 The Annual Giving Tree is a beautiful reminder of the kindness and generosity of our donors while symbolizing the shelter, support and foundation that St. Anne’s provides for our beloved Residents. Every gift is important and sincerely appreciated. No gift will be forgotten. Gifts of $249 or below will be recognized in a lovely binder that will be placed next to our Giving Tree. For more information, please contact Mary Jo Diffendall, Director of Development and Marketing, 717-285-6539.